Why a month with no cheese, chocolate or wine might just be worth it. 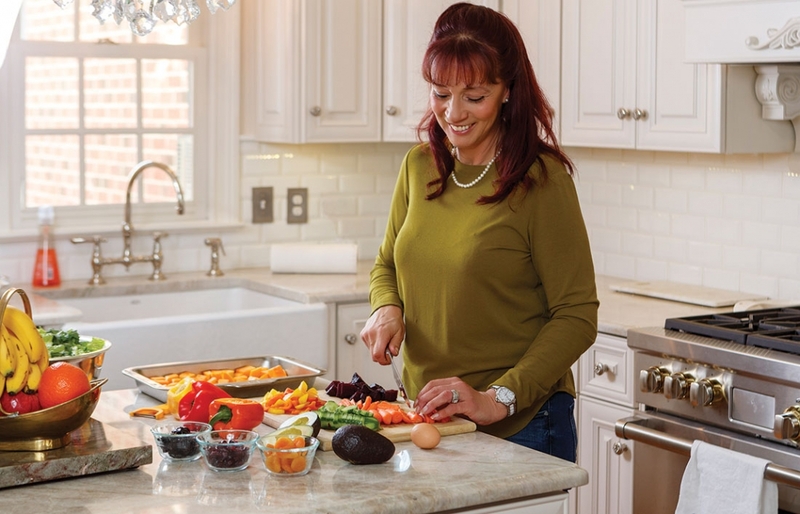 Nancy Whiteley of The Busy Bee chef prepares Whole30 foods in her home kitchen. Radiant skin. Deeper sleep. Surging energy. Mental clarity. And yes, weight loss. 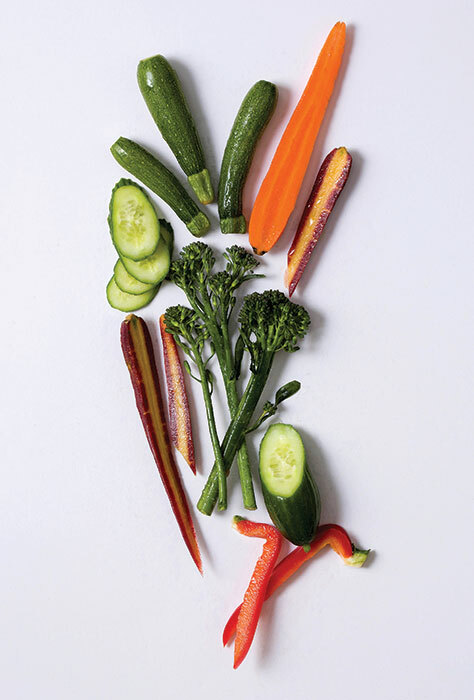 Vegetables get promoted from side dish to main event during your Whole30. Options are nearly endless, from artichokes to zucchini. All are results many report after finishing the Whole30 — a detox program that eliminates all grains, dairy, legumes, sugar and alcohol from your diet for 30 days. The restrictions are severe, but the goal is lofty: to help identify and eliminate foods and behaviors that could negatively impact your health. Gut offenders can be any foods that may cause inflammation in your intestines. Foods like whole grains, beans, peanuts and dairy — ones we typically think of as healthy — are off-limits for the length of the program, allowing a person’s body to “reset” before adding these potential offenders back in. Plenty of vegetables, fruits, high-quality meats, nuts, eggs and healthy fats fill the Whole30 plate. After the 30 days of elimination comes the reintroduction phase. Participants are instructed to add the forbidden food groups back into their diet one by one and see how they feel. Judge if beans, for example, cause any negative reactions. Thirty days without cheese or wine may sound like torture, but complaints tend to be muted by accounts of dramatic results. Most participants experience some weight loss, but it’s the “non-scale victories,” as the program dubs them, that define the program. “If you go into it just expecting weight loss, you are coming at it from the wrong approach. It’s so much more than that,” said DeBoard. While on the program, Apex resident Danie Summers says she felt an overall desire to live well. In January she completed her second round of Whole30. 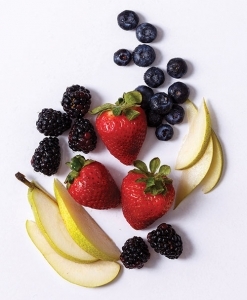 Spring and summer make great months to tackle the Whole30 because plenty of produce, like berries, lettuces, tomatoes, squash and okra, is in season and available locally. Power in numbers: Enlist a spouse, partner or friend to Whole30 with you. You can share the planning and cooking tasks and keep each other accountable. Fully commit: Eradicate the notion of a cheat day or any slips for 30 days to experience maximum benefit. Anticipate inevitable challenges: Friends going out for drinks? Birthday cake at the office? Don’t give yourself any excuses, and choose to stay the course. Read food labels: Sweeteners and additives hide in foods you wouldn’t expect. Summers came across the Whole30 through stories about her husband’s coworker. At first, she thought the program’s strict guidelines were the most absurd commitment she’d ever heard of. 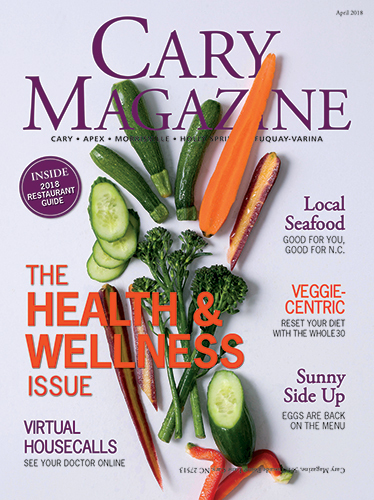 But one impression struck a chord — the coworker began the program because she felt out of control of her own eating habits. Later, after a trip to visit family, Summers herself felt entirely thrown off her routine and unable to make her own food choices. 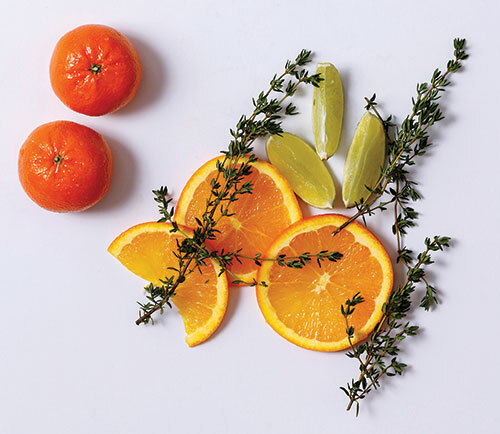 Fresh herbs and citrus fruits are building blocks of delicious Whole30 dishes, says chef Nancy Whiteley. Inevitably the day will come when you have to work late, get stuck in traffic or just CANNOT wash another dish. Have compliant options on hand, particularly heat-and-serve proteins, to save you a hangry trip to the grocery store or a program-ending drive-thru run. Danie Summers recommends: Aidells Chicken and Apple Sausage, Costco’s Pulled Pork and Applegate Farms Uncured Beef Hot Dogs. “My biggest takeaway is that it gave me the power to decide what is and what isn’t worth it. It’s not that I’m never going to eat ice cream again, but I may never eat Halo Top again,” said Summers. As a culinary professional, Nancy Whiteley saw the rise in popularity of the Whole30 firsthand. She completed the program nearly three years ago while she was in the early years of her personal catering business called The Busy Bee Chef, which offers weekly meals for families delivered to their homes. When her clients asked for Whole30-compliant meals, Whiteley was ready. She says with a limited list of ingredients, it is important to focus on flavor. “Add in lots of really good, fresh ingredients — a lot of fresh-squeezed citrus and fresh herbs,” she said. Since participants must prepare nearly every meal at home, Whiteley says to save effort by using recipes you are familiar with and “Whole30-ize” them. “To make my chili recipe, we have to leave out the sugar and beer and beans but can put in everything else,” she said. Get creative with your substitutions, she advises. Pick spaghetti squash or cauliflower rice instead of pasta. Trade tortillas for a taco bowl piled high with pico de gallo and guacamole. Wrap hamburgers in sturdy lettuce, like iceberg or romaine, in place of a bun. And be careful about prepared dressings and sauces, which often include added sugar or soy sauce. 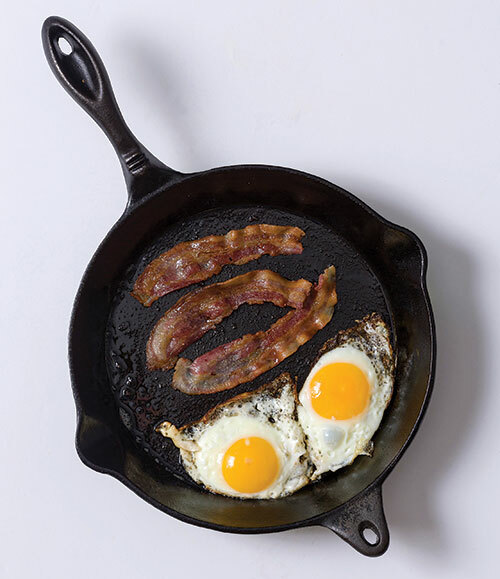 Eggs and bacon are a go-to Whole30 breakfast, but with cereal, oatmeal, muffins and yogurt off limits, many struggle with adding variety to their morning meal. Last night’s leftovers, veggie bowls and sweet potatoes are all great options — especially when topped with a fried egg. As long as the foods are program approved, there’s no need to count calories or restrict portions while on the Whole30. “I made all my salad dressings, and a stir fry sauce, from scratch,” said Whiteley. With its limitations on grains, legumes and even honey, the Whole30 is the most restrictive of the special diets she has cooked for, she says, but it is beneficial for resetting your metabolism and learning what’s making you feel bad. Toss the squash and beets in the olive oil and sea salt. Roast vegetables at 400 degrees F for 40 minutes or until tender. Remove from oven and let cool. Toss lettuce and arugula in a large bowl to mix. Arrange the squash, beets, dates, carrot, almonds, cranberries, bell pepper and egg slices over greens in stripes. In a blender, combine Dijon mustard, Champagne vinegar, lemon juice, salt, pepper, spices, ginger and parsley. With the blender running, drizzle in the oil until dressing is combined. Natural fats are an important component of every Whole30 meal. 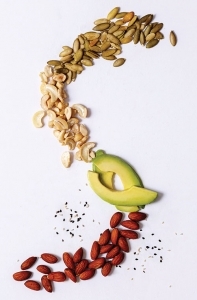 Nuts, seeds and avocados are great sources. Whole30 House Arrest: “It’s almost impossible to eat out and be strict Whole30,” said Jordan DeBoard. “You really have to adjust your social life.” Find ways to socialize that aren’t food-centric. Danie Summers advises scheduling your Whole30 for a low-key month, when you don’t have any special occasions, holidays or vacations planned. Skeptics and Doubters: Friends or family might get frustrated when you can’t join them for happy hour or taste test their latest baked creation. Prepare to answer the question, “So what can you eat?” many times throughout the month. Stay positive and let your results do the talking. The program probably sounded crazy to you at one time too.